I believe everyone attended yesterday’s talk, right? So, today we are going into more of the physical through the mental. The important things is the approach, because it’s a learning process. The learning process is only to recognize and realize, not to think. Thinking—out the door, go. We say that to watch, observe—that means paying attention. The first thing we need to do is make sure the attention must be there. The process first is Yi (the attention), then the energy (chi), then the power (li): the yi chi li. If attention is not there, you cannot know–how can you know? Here is a problem a lot of people have. If attention can’t be there, then when you try to act, you fall down into habit—not recognizing. That is why the training is by linking—like joining—by stretching. By stretching from one point to another, this is called unification. We talk about first unify yourself: mentally, physically. Then, there’s unification on movement. Then unification on point of contact. First, there’s hardware unification. Second, is because moving, there’s a coordination of movement. Then, you need to have Point of Contact unification: you have joined. Yin ling: Absorbing to dan tien (all yin to dan tien); then also condensing to the bone. That means the Yin cannot interfere with the Yang. The yang can’t interfere with the yin. It goes to the bone and stops [demonstrates bringing left hand up to center line; claps precisely at this halfway point, then other hand goes down]. Goes to here: stops, then the yang takes over. If it goes over, that’s violating. This yin comes together and it wants to go over, but the yang helps support. In training, in Chinese medicine or meridian point we call this Macrocosmic energy flow, the chi flow. The energy that goes to the bone (that has Expand Condense)—this is called Bone Marrow Washing (neigong). All movement must have these two: Macrocosmic Energy and Bone Marrow Washing. All movement also evolves from one point: the center point (dan tien is a center point; ming-men is a center point). But the most important point is the feet: the feet with the mass. The mass falls on the dan tien: then on this builds the alignment. With this alignment, it means all action on the point starts with Rotation. The spinning force, the spiral energy—and it creates open close. Open close, we have 3 dimension open close, but then normally we work only on 2- dimension open close at first: vertical line, horizontal line. (See, this is close, but I’m opening but I’m not open yet: until this is neutral. Closing, closing closing, neutral, closed [demonstrates on horizontal and frontal planes]. Because open and close have different energy—because open you can project (you don’t absorb): you project, project, project to close, then you close. Then, I absorb, absorb, absorb to neutral then open. Because it’s the coordination from the further point to the furthest point: the longer the leverage the greater the power. Ok? So, horizontal is the primary spin because the whole world, the whole universe spins horizontally. And only in horizontal spin do you not leave the ground [demonstrates as he grinds index finger into palm: ‘in horizontal you don’t leave the point’. [Sifu demonstrates contrast: like a wheel hitting ground: how frontal and sagittal both leave the point]. So you need to start with horizontal. 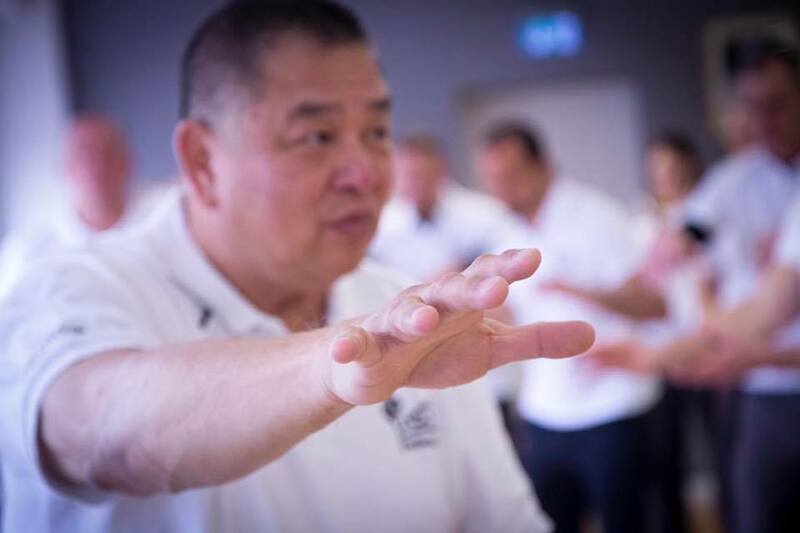 [Sifu points to shoulder joint as root and explains: project from the shoulder joint: from our C7] then rotate open close. Here is the very primary movement. So from understanding Absorb Project, Condense Expand ming-men—from this you do Open Close, and that is how you recognize the neutral line. Then, when you do Open Close, you recognize how you do circles: because there are only 2 circles—you do rotation either clockwise or counter-clockwise: no other movement. From this movement here you create Concave Convex—because this [does NSEW as concave convex]: that means there’s yin yang to complete these circles. To complete these circles you must complete the cross: That means you must go through the cross—the vertical line, the horizontal line—and that means you go through 4 quarters, yang/yin. For example, you cannot say this is complete [does it wrong with no connection between shoulder and wrist]. Yes, this is complete if only doing the wrist [waggles only his wrist]. But if doing whole shoulder, you must have this [demonstrates connection from shoulder, elbow, to wrist] This is Section: shoulder (or elbow, or wrist). Everything must have yin yang touch. Concave and convex also gives direction—like a fish moves [demonstrates shoulder to elbow moving in relation to each other]: a tail goes like this. [wiggles elbow to wrist moving like a fish’s tail]. You must understand how movement follows this line (shoulder joint). If you don’t follow this, then the Point of Contact is already wrong! From here you must understand the 3 Planes: horizontal, frontal, sagittal. This is 3 dimensional. This means everything must have a center with 3 dimension: that means it must include 6 direction energy and 3 dimensions. These are the 5 Mechanisms you must understand. Later on, this is unified self and unifying movement. When you say ‘unifying with opponent’, I’m 1 opponent is 2, but the Point of Contact is the 3: there’s one, two, three points. On Point of Contact, any point of contact, there’s yin yang: a cross (you can also say 3 dimensions). Every point of contact has 3 dimensions. But one dimension starts with 3: yin neutral yang. The dividing line between yin yang is the neutral line that DEFINES the position; that defines the yin and defines the yang, or you can say it’s defining the OFFENSE and DEFENSE. When you play football, a field has half line: behind half line you are defending; when you cross the half-line you are attacking. But you must be able to know where is the half-line. A half line is also a Point, because a point gives direction, so if you take care of the line, you understand what is offense and defense. That means we approach through the Zhong Xin Dao: through the neutral line, through neutral point: so you can see everything in One point. You don’t see from yin to see yang, or from yang to see yin… of course if you train yang, you also train yin. But in your viewpoint of training you must approach from the Center. If you don’t approach from the center, you cannot link the two: you will be seeing one side to THINK of the other side because you can’t “see”—you can only guess. So, you won’t have a COMPLETE view. Can do only from approaching from the separations and the unification—this separates the two and binds the two. So in movement of course if you can’t separate you’re also in trouble. If you can’t join, you’re also in trouble. If people attack me too much, I separate, then they can’t connect…but normally in our training, we maintain connect first, maintain connect first to understand what is one point of defense. One point of defense under 3 dimensions—in Tai Chi they talk about Peng energy, the defense one. This is not action—it’s the energy, the energy of Peng, the energy of fullness. This fullness is 3 dimensional…behind ALL movement. Right? It’s behind all the movement because the 3 dimensional energy behind all the movement is neutral. That neutral helps you to change. That neutral helps to give you readiness and alertness. So, because this fullness energy, or we call it oneness energy, has the Peng energy. In ALL movement. That means, how can you understand this Fullness energy on point? This Peng energy on point? As a neutral, it means what? That it has a center point, a highest point. Highest point is a mountain. Or you can say the furthest point. The furthest point is like a ball: any point you touch is the furthest point to the center because it’s a diameter line. That has the quality of that. The thing is that we are straight, not a ball. So where is the reference that you say so you can create the furthest point? That means it’s the CENTER LINE TO THE MASS, the Center line to the Point of Contact—and where the Point of Contact creates a vector force, a triangle energy force…or sometime s we call it Peng energy or the fulcrum point, or triangle energy, or a cone energy. So, on the point here, you have a ball or like two balls that come together, they come together and touch each other, that is the fullness point. Because they have 2 fullness, they touch each other. It also has the 90 degree to touch at the center. So we say attack is 90°; but you must be able to receive 45° on the POC. Attack 90°, receive 45°, is the straight with the curve energy. Every movement is straight and curved; because of this (90° and 45°) it’s the circular energy: circular energy must have 90/45. So we talk about 2 to 1; 1 to 2: Two to one means we have Absorb Project or Condense Expand (2 energies) that form ONE COMPLETE fullness energy. Form this is 2 to form 1 at the Point of Contact. On the Point of Contact, you must at minimum have 2 energies out: 1 to the bone structure (skeleton) and the other to the Mass (your alignment). Skeleton and mass are two different things but they are related. Skeleton is the back bone; if you don’t have skeleton, no movement; but skeleton is not the balance beam line, it’s not the alignment. Alignment is from the mass and the gravity. The mass is the flesh and tissue including the bone. Including the bone that has a center of mass. The center of Mass weighs on the center of gravity and forms alignment—but you need the bone to coordinate with. Once you capture the mass you control the object. But, on the point, if you can also get 6 direction energy, you can know…how to create the point to create 6 directions…if you can do that, that means you are neutral. When you are neutral that means you can change. With that neutral energy you must include readiness, alertness. We can use Yin point of contact. Project is from the Yang to the yin; you don’t project from yin. Always in this direction. Because we are following the nature of the body. The nature of the body is that Yin is drawing all the time. If you start to reverse, the energy goes wrong: you lose the cycle, you lose the balance. That doesn’t mean that Yang can’t expand, for Yang can expand. That’s why we say first it’s the hardware then the software. Because the Yin has Yin Yang; the Yang has yin yang. [Demonstrates how the two must maintain both energies: there’s yin energy drawing…to the maximum draw—if you go more than this you lose the yin quality and violate the yang energy]. The yin energy must be always there because it’s the yin energy. You can’t go against the yin nature; you can’t violate the yin or violate the yang. But yin can do the action of yang a little bit…understand? The rule is that FOLLOW THE NATURE. OBEY NATURE. In the truth of nature there is no freedom. You can’t do what you like. You’ve got to base on the nature itself, yes, that’s why we call it The Way. The way is not that you like it (understand it). It’s not that I like it—so that’s my way; no, that is your habit. That is your feeling, a past feeling (I like this, I don’t like this). That is not the true way—that is the Ego. Alright? The nature of things has its characteristics you have to follow. We are part of nature. If we don’t follow, we go against. If you go against, and you do it more, you are the one who suffers. That’s why the way things are in the Tao is understanding the way things are. It has its rule. All the time we follow the law of nature—it’s different from following the human law. In sport, in competition, this is human law—it’s not law of nature. That’s why a lot of other martial arts don’t want to spend time in tournaments. Yes, you can train—in lower levels you can go and train, but higher level…no. Any things that human make laws you have to remember; once you ‘remember’ then it’s not the law of nature any more. Because you have to remember, that means you’re already cut off; in the law of nature there’s no remembering, it’s CONNECTING. You cannot remember. The Law of nature is CONNECTING THERE—it’s based on yin yang: based on adaptability. You cannot go, “oh, can’t go’ or if you think “I cannot go’ that means you’re thinking…you can’t go above. You aren’t with the law of nature. That means you fall on the ‘knowledge’—and you can’t go above to the Wisdom level. No chance—you can train 1 million years but still no. The thing is so straight. In our Zen training in our system training because there’s Knowledge and Wisdom—later knowledge and dumb: because you are crossing over here, but when you’re crossing over here [to a new understanding] hanging over you don’t have enough clarity, or not enough to penetrate (we call it) or to link—not enough. But I can hang over there, not to go back. In every training we call this a process of ‘dumb-dumb’/like stupid: the process of dumb dumb—it’s tranquility, it’s peaceful, it’s balanced.. but not the wisdom…. But you can hang over there and not fall back over there… you look very smart (because you go through thinking: what you like, don’t like). But of course we DO fall back onto knowledge; then, at least we know we are falling back on knowledge. You must know that you are judging; it’s not absolute truth; you are judging.